I’ve started in with the hooligans over at the Mid-Willamette Valley Eat Local Challenge, representing the South Valley, an emissary of sorts. The challenge is to incorporate more local products into one’s summer cooking. Frankly, if you’re not doing this already and you live in the Willamette Valley, you’re missing out on some of the best produce, meat and nuts in the country. I’m going to track what I’ve sourced and talk more about the changes we’ve made to our diet over the past five months since I’ve been back in Oregon in a later post, but for now, it’s all about CORNED BEEF made from local brisket. One of the chief joys in my life lately is, as I have mentioned, my Family Food Education/Master Food Preserver training through OSU Extension. This week, we learned about emergency food storage and root cellars, and spent several hours making cheese. Does it get any better than that? Why, yes, it does. A few weeks ago, we had a presentation on how to corn beef and tongue. My friend Janet is a tongue fan, so she asked me to provide the recipe. I told her I had to make it first to see if I could replicate the deliciousness, and, after three weeks of prep and curing, it turns out I could! 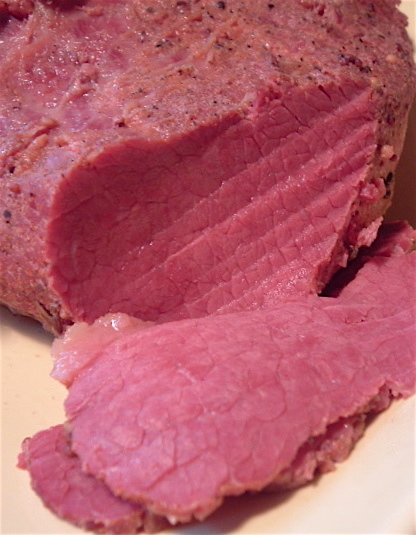 This recipe is my adaptation of OSU Extension Service document LC 712, “Deli-Style Corned Beef or Tongue.” Other cuts to try include pork loin (for Canadian bacony taste), bottom round, and shoulder. Check to make sure your brisket will fit into a ziplock bag before the process starts, and plan for several weeks of curing time! 1 beef brisket (or tongue), 4-6 lbs. Toast spices in the spice mix in a small pan over medium heat until mixture smells aromatic. Crush spice mix spices in a mortar with pestle. Mix together sugar, all spices, and Tender Quick in a small bowl. Prepare brisket or tongue by removing whatever surface fat you can. 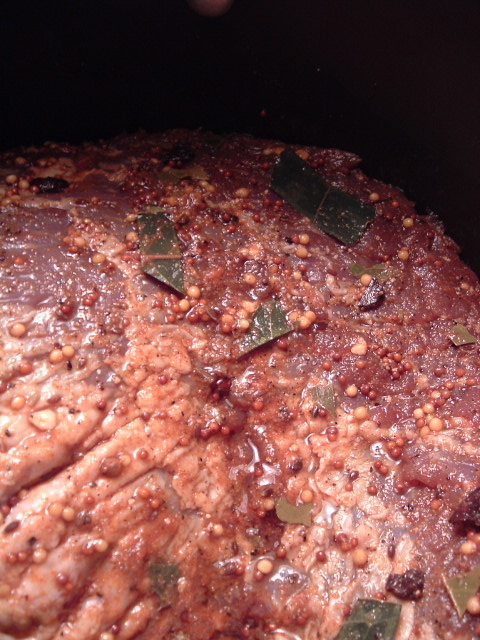 In a bowl or platter, rub mixture well into the meat, covering all exposed areas. Place meat in ziplock bag, seal tightly, then place into another ziplock bag for safety, and set on clean plate. 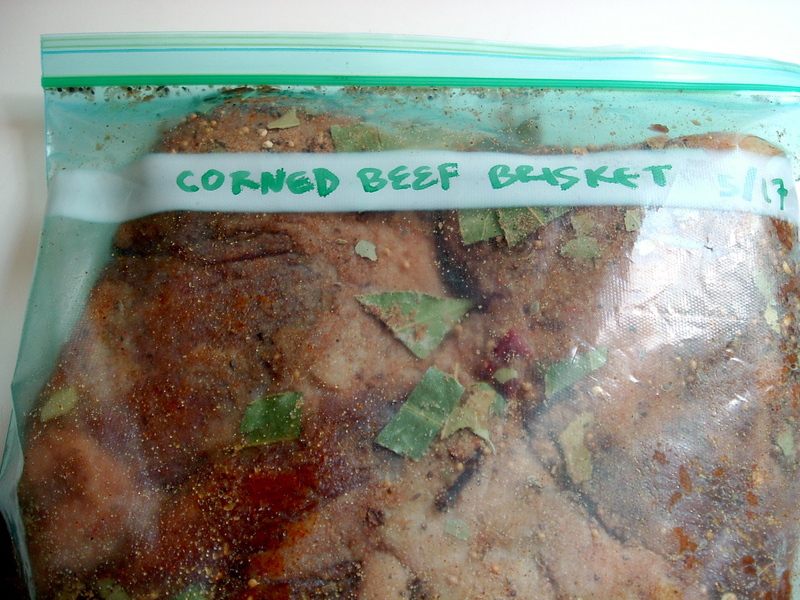 Allow meat to cure in refrigerator for five days per inch of meat thickness (measure at the thickest part). A corned beef brisket is usually around 2 inches wide; tongues are much wider, so plan for three weeks for a large tongue. Turn bag over every other day. Place fully cured meat in a large stockpot, and add generous amounts of water to cover. Bring to a boil, skim surface, and reduce heat to a simmer. Cook until tender, about 3 to 4 hours. Tongue will be done when you can skin it, and you should skin it before serving. Do not do this in room with vegetarians. In the last 30 minutes of cooking, you may add whole new potatoes and/or cabbage to the cooking liquid. Let sit for 10-15 minutes before slicing, or meat will fall apart. Eating new vegetables always seemed slightly inhumane to me; something like facing spring alone or long in the tooth or with one’s eyes more dull than wolfish. It’s like cutting fecundity down at the knees: eating what we grow too young. Each year I smell the feral mud and think the same thing and have as long as I can remember, and again, it is May, and I catch it in the air: that something horrible awakening when the year is new. Then I think: they’re radishes, for god’s sake. Eat them. And I try not to think at all about the eggs. Hence, a salad with no more exegesis than a reference to what inspired me, Adam Roberts’ “killer salad,” a lettuce-free mix of spring vegetables in risk-aware consensual raw eggyolk dressing. I used multicolored “Easter Egg” radishes and new carrots from Hey Bayles farm via the Saturday Market, peas from my garden, some leftover grape tomatoes and avocado from god knows where, and a liberal sprinkling of chive flowers, also local beauties. You should use what your conscience dictates. Dresses one big bowl of no-lettuce salad. Use less for lettuce, and use promptly, discarding leftovers. Whisk together all ingredients but the olive oil. 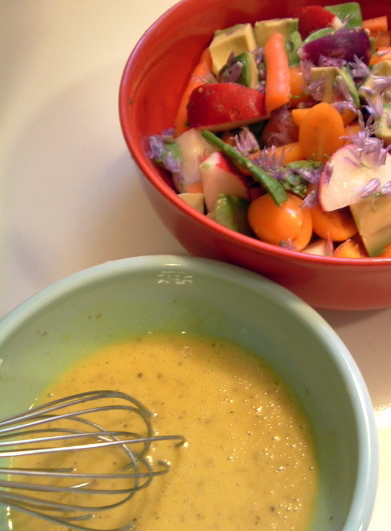 In a slow, thin stream, add the olive oil while whisking to make a thick, emulsified dressing. You may choose not to use the full 1/4 cup, depending on your taste. When emulsified and seasoned to taste, quickly blend with the waiting salad, and serve immediately. No rain yesterday! We did our Memorial Day BBQ last night. My fellow blogger Market Cook in Albany turned me on to this simple way to improve heat retention for long-smoked bbq in an old-skool Weber kettle grill. Immediately, I passed it along to the Five-Star General of Grilling in my household, my husband, Retrogrouch. (You may see him in the above picture, lower left corner.) He tried it out and deemed it a success! The trick is to wrap the inside of the grill with foil, use fewer coals, insert a drip pan full of water to keep up the humidity, and place the meat to one side. 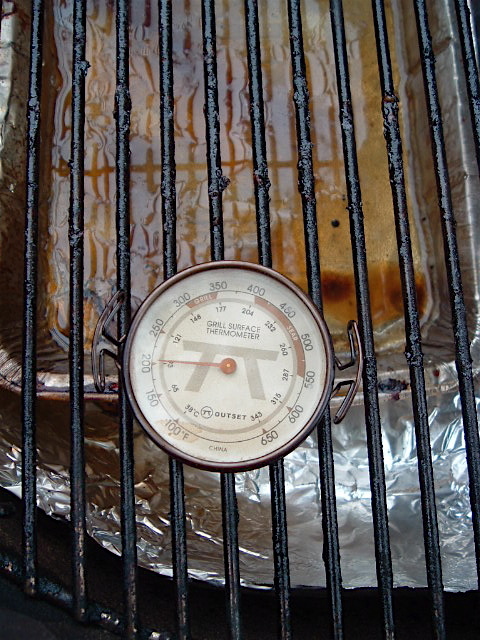 He kept the temperature very low and maintained its level by only peeking at the meat once. To check the grill thermometer sitting on the grill grate, he used a flashlight to peer into the holes in the kettle lid. As the Lieutenant in charge of salads, sides and eating of the meat, I sampled the results…yum! 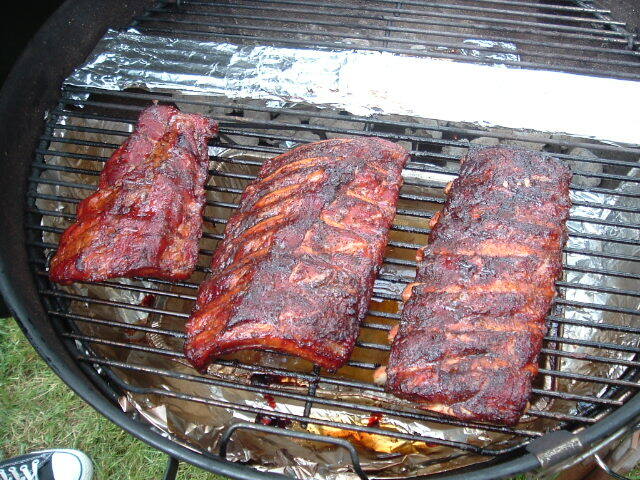 We did one little slab of baby back pork ribs (from our local Sweet Briar Farms) and another slab of pork ribs, cut in half, to experiment with different dry rubs. They were all delicious, but quite frankly, I liked the simple salt-and-pepper rub the best. 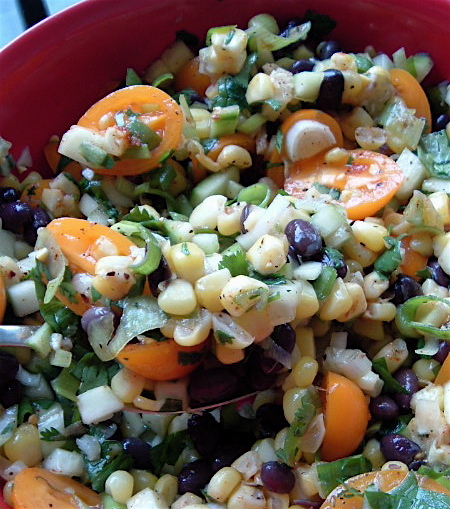 The black bean corn salad I made was really a freezer-burn special, but with fresh ingredients it could be even better. We used corn cut off the cob that had been frozen since August. It’s the perfect accompaniment to bbq. 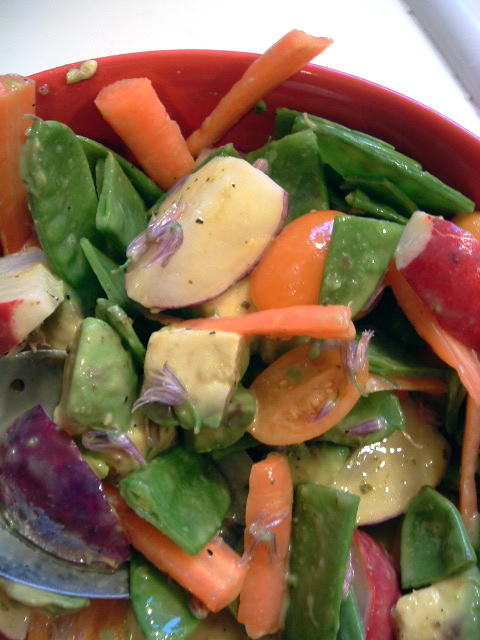 There are as many ways to make this salad as there are cooks, but each one is very tasty. I use a light dressing with mine — a squeeze of fruity lime juice, cilantro, and green onions — to balance the starchiness of the corn and beans. Mix together all ingredients; stir; serve. Good add-ins include firm avocado, red or green bell peppers, parsley. I offered to do the “Book Wisdom” meme, after seeing the delicious roasted chicken at Married with Dinner. My foodie books, unfortunately, are low on the pretty prose, high on the instructions. Strange, given I’m so purple-prosaic. But regardless, I’ve been researching recipes for chard (for a newly vegan husband of a close friend) and fava beans (for my CSA farmer, whose crop is almost ready). That means I have nearby the PNW gardening bible, Growing Vegetables West of the Cascades by Steve Solomon; my favorite Japanese cookbook, The Heart of Zen Cuisine: A 600 Year Tradition of Japanese Cooking by Soei Yoneda; and Fred Plotkin’s marvelous La Terra Fortunata: The Splendid Food and Wine of Friuli-Venezia Guilia, Italy’s Great Undiscovered Region, which I bought after becoming enthralled by the banquets at a Joyce conference in Trieste a few years ago. So I can bring you wisdom about using black wine barrels for solar greenhouses, mixing up miso for fried eggplant slices, or, the one that intrigued me the most this Memorial Day weekend, Sguazeto, a regional meat sauce. 1. Pick up the nearest [foodie] book. 5. Tag 5 other people* and acknowledge who tagged you. *Like Anita, I won’t tag anyone, because I find that annoying, but I’d love to hear from you if you decide to join me. Soak the prunes  in warm water until softened, about 30 minutes. Drain. Combine the pine nuts [1 heaping T.], sugar [1 scant t.], and cumin [1/2 t.] in a mortar and pound with a pestle until you have a fine powder. Not much to work with there, eh? Believe me, the others were worse. I find, as a literature grad student, that books aren’t always wise, at least not in small chunks. The recipe is from Plotkin’s book, and as I mentioned above, it is for Sguazeto, a rich meat gravy used in the northeast corner of Italy. The ingredients above are then mixed and cooked gently with a cup of roasted meat pan juices. 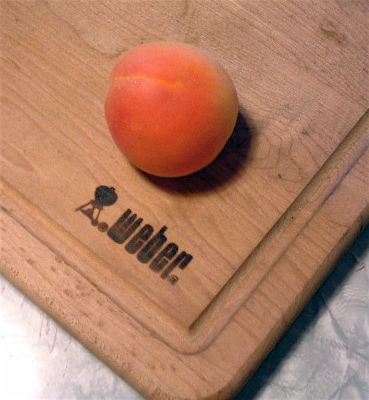 Plotkin suggests substituting prune jam (lekvar) or apricot butter for the dried prunes. But look at the combination of ingredients: a musky, sticky, sweet dried fruit, pine nuts, sugar and cumin. Perfect for an unusual, fruity barbecue, no? So I bring you my inspiration. I received a bag of early apricots in my CSA share this week, so I have apricots on the brain. I am sure it would be delicious on grilled chicken or tofu. You could even brush a bit of the sauce on the grilled object *just* before taking it off the grill. Don’t do it too early, though, because there is too much sugar in the sauce and it will burn on the hot grill. Soak dried apricots in warm water until softened, about 30 minutes. Drain. Combine the pine nuts, honey, and cumin in a mortar and pound with a pestle until you have a fine paste, or use a food processor. Before grinding, save a few pine nuts for the garnish. Chop the apricot and add it to the mortar/food processor and pound/process until smooth. If you are using apricot butter, just mix it into the paste. Heat 3 T. olive oil in a saucepan on medium, add the apricot mixture, the vinegar, and the chicken stock, and simmer to meld flavors, for about 10 minutes. Grill your chicken or tofu (or even halved, fresh apricots) as desired, dressed simply with salt and pepper. Remove from grill and top with apricot sauce just prior to serving. Garnish with chopped parsley and few whole pinenuts. It’s flowering flowery flower time in the Willamette Valley. The rhododendrons in Eugene are always spectacular, but this year, with the weird cold/hot weather pattern, they are extraordinary. We have four mature rhodies, none of which I would have planted myself, but even I, begrudgingly, will say they look fabulous. The problem is that someone who lived here really, really, really liked purple. I suspect it was the crazy lady with the dogs. Most of the mature blooming landscaping around my house is in the range of purple, fuchsia and pink, and I’m more of a red-orange person. So I can’t help but be overwhelmed when a mushroom cloud of fuchsia attacks me in my front yard. I can’t offer any solution to those of you suffering fuchsia attacks, but I can say that I’ve found a lovely use for one, tiny fuschia flower: the head of a flowering chive, now in bloom. This week, in my Master Food Preserver class, we did flavored vinegars and jellies. 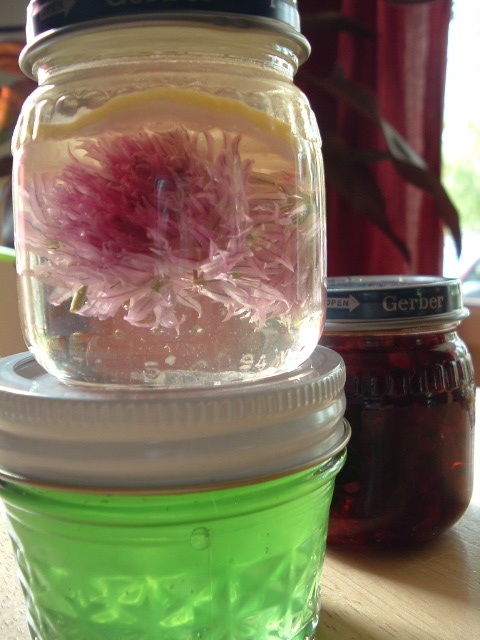 In the top picture, you can see a rather beautiful and easy chive flower-lemon infused vinegar. Herb or flower-flavored vinegars are easy to make in small batches, and don’t need any processing because of the tartness of the vinegar, so anyone can make them. The only thing you really need to be aware of is that you don’t want to pack in too much dense, low-pH stuff (like jalapenos, for example), or you still can run the risk of botulism. In a clean jar, add enough flowers or fresh herbs to loosely pack the jar about a third full. Another option is a slice or two of lemon or lemon zest, or a berries (frozen are best). Fill jar with white wine or plain white vinegar. (Cider vinegar has a very distinctive taste, as does rice vinegar, but you’re welcome to use these if you have a complementary berry or herb.) Cover the jar with a non-metal lid, or, alternatively and more messily, cover with plastic wrap before screwing on your metal lid. As you can see, I made my vinegars in baby food jars, but I’ve since moved them to containers without metal lids, because vinegar rusts metal over time. Let mature for at least a few weeks and preferably several months in a dark, cool cupboard. Other flowers can be used, too. Our MFP instructor makes nasturtium-garlic vinegar, and I made not only the chive blossom-lemon but also Marionberry-Szechuan peppercorn, with those little lovely floral buds from China that are once again legal in the U.S. Next year, I’m going to try strawberry blossom vinegar with my first-bloom Seascape strawberry blossoms, which should be removed anyway to strengthen the plants. Edited to add: Some of my favorite flavor combinations, now that I’ve been doing this for several years, are Concord grape-star anise, Marionberry-thyme (with either white or red wine vinegar), the Japanese citrus called yuzu and garlic (with rice vinegar), and jalapeno-onion-garlic-salt in coconut vinegar (this is a homemade version of Phillipine spiced datu puti). Non-blend vinegars I make regularly include tarragon in white wine vinegar, cranberry, chive blossom, and red ripe jalapeno. The only flavor I don’t care for in vinegar is sage. Rosemary also tastes medicinal. I had planned to write a fat, juicy post about salmon when the season got underway, but now that it has been canceled up most of the West Coast, the wind is out of my sails. Alaskan Chinook is still available (at a eye-popping premium), and some places in Washington are still allowed to fish, but our salmon-lite fish markets look pretty sad. So here’s a quick primer on West Coast salmon. Cook’s Illustrated devoted a text box to salmon types recently, but spent a disproportionate time discussing Atlantic salmon, which, quite frankly, doesn’t hold a candle to the Westside. We don’t eat Atlantic farmed salmon here in the PNW. And we also wish Cook’s Illustrated would get a West Coast correspondent, because they’re way too Eastside to be helpful for many product articles. Anyhoo. Chinook or King. Dark pink, moist, fatty, large flakes. Delicious and mildest. Sockeye. Red. Smaller flakes, strong salmony taste, small flakes. Can be dry. Coho or Silver. Orange-red. Milder than Sockeye but not as lovely as Chinook. Each of these salmon have slightly different seasons, and are available frozen or fresh, with corresponding prices, and from a number of different places. There’s also Chum or Dog, which apparently can be like Chinook if you get it from the Yukon River in Alaska; Pink, of which a large proportion is used for canning commercial tuna, and Steelhead, which is not a salmon at all but is red-pink like one and still rather tasty. But the salmon we’ve been eating, thanks to our budget? Chinook salmon trim from Newman’s, at $5.99 a pound. Trim is the little bits and pieces that are trimmed off when making the fillets look pretty. One can use trim for omelets, quiches, curries, and salmon burgers. Since you can only buy nasty Atlantic farmed salmon at large chain grocery stores that price, it’s quite a deal. Not being much of a salmon burger person but liking the concept, I transformed one of my favorite salmon recipes into a salmon patty topping. Kasma Loha-Unchit, a Thai cooking instructor and cookbook author, has a beautiful recipe for Wok-tossed Salmon with Chilies and Thai Basil in her seafood cookbook, Dancing Shrimp: Favorite Thai Recipes for Seafood. 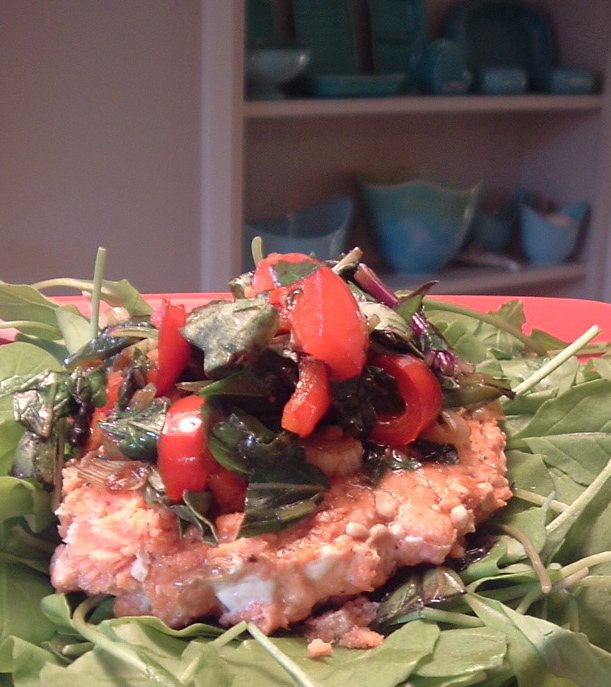 She cuts the salmon in chunks, then stirfries them with a mix of red and green chilies and a big handful of Thai basil. I still don’t have my kitchen hood installed, so stirfrying is a pain, so I baked the salmon whole instead and it was wonderful (and less fattening). I amended her recipe by adding a few more vegetables: notably arugula, since I didn’t have enough Thai basil, and a handful of winter cherry tomatoes. The arugula and cherry tomatoes worked really well to capture the sauce and add sour, bitter undertones, so I left them in the final recipe. They aren’t in the least bit authentic, but I think they add something to the dish. If you have the funds and no salmon crisis, the Thai basil and pepper topping works wonderfully on a large fillet of salmon, or on smaller pieces for individual servings. You can grill the salmon or bake it, as I did here. Sockeye works particularly well for this recipe, as it is darker and stronger in flavor than Chinook. But we have neither funds nor happy salmon. The picture above is an adaptation for salmon burgers. I formed one pound of raw salmon trim into four “burgers” and baked at 425 for about 10 minutes. Served cold the next day over arugula with nothing more but a squeeze of lemon and the basil chili sauce, my “salmon burgers” make a fine summer luncheon dish, too. The roasted chili paste is crucial for this recipe. You can make your own or buy it in Eugene at Sunrise Asian market. If you can’t find it, you should be able to find Thai red curry paste, which is a completely different flavor, but still good. Brush salmon with oil and sprinkle with a bit of fish sauce and white pepper. Add a 1/4 cup white wine or some stock or water for moisture. Add cherry tomatoes, whole. Roast the salmon at 400 degrees, covered, until center is cooked through. *For the salmon patty adaptation, use 1 lb. of salmon trim. Form into four patties. Slick Pyrex pan with oil, then place patties in pan and season with white pepper and fish sauce. Add cherry tomatoes. Roast at 425 degrees for about 10 minutes. The time greatly depends on the size and content of fish trim in the patties, so check for doneness after 8 minutes. While salmon is roasting, prepare prep dishes with ingredients in (B), (C) and (D) separately. Remove the salmon from the oven when done. Add the tomatoes to the sauce in (C), smushing them into the sauce. They’ll add some texture and bitterness to the final dish. Quickly stirfry (B). Add (C) and let flavors meld for a moment, then add (D). Wilt the greens, pour over waiting salmon, and serve immediately. Pails of Oregon strawberries. What could be nicer? Eugeniuses, It’s time for the 16th annual Emerald Empire Kiwanis Berry Sale. These are the folks you see causing pile-ups at Valley River Center, distributing Oregon-grown strawberries like drive-through Johnny Appleseeds. The strawberries come in one form: fresh, cleaned, sliced and unsugared, and you can either buy a 30-lb. pail for $41 or a 15-lb. pail for $27. You must order by June 2, and pick up in the afternoon of June 19. Also available are 9-lb. pails of quick-frozen strawberries, marionberries and blueberries, for delivery in August. Order soon by mailing in the form on their website, or by calling 541-607-4065. I’m holding my breath that my two-dozen Seascape strawberry plants will come through for me, but if this heat destroys them, I’ll be there with you in line! Until then, let’s work on those other strawberries; you know the ones. California strawberry season is in full swing. It’s the time before regular strawberry season, when the stores insist on selling those huge, sour, bright red, white-crowned things. I am seduced just like you are, and I take home a package of “Crown Jewels,” thinking they look so good this year, but soon realizing “jewels” mean they are as hard and inedible as a diamond. So I sugar them down, disguise them with whipped cream, and save a few for my real California strawberry annual event: a strawberry mud mask. Try it. It celebrates spring, mud, and making the most of a subpar foundation. Without fail, I do this mask every spring, before the strawberries start to taste good. It really does feel nice, making your skin tingle and glow pinkly. Apparently, strawberries are full not only of Vitamin C, but also salicyclic acid, which freshens the skin by removing dead cells. Take three or four fresh berries, chop them, and then puree them in the food processor with about 2 tablespoons of a pre-prepared mud mask. I use the basic supermarket brand, but you could get fancy and make your own with rhassoul mud, yogurt, and/or honey. You just need something to bind the berries. Go for it. And let me know your recipe! You can also grind down the berries by hand, but it’s important to completely smash them, or else you will have large berry bits on your face. Spread mud mask on your face, chest, feet, wherever you need it, and leave on for 15-20 minutes. It will dry a bit, but not completely. I advise doing this before a shower, because you will get strawberries in your hair, no matter how hard you try. Wipe off mask with a clean, warm, washcloth, and rinse in kitchen sink so bits won’t get fester in your bathroom pipes.